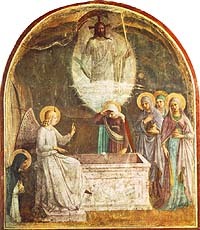 Fra Angelico (c. 1400-55), "Resurrection of Christ and Women at the Tomb" (1440-41), Fresco, 189 x 164 cm, Convento di San Marco, Florence. I would guess that many Christians today believe more in the "immortality of the soul" than in resurrection. A belief in "going to heaven" is much more in mind than one's body being physically raised from the dead. But resurrection from the dead -- especially Jesus' own bodily resurrection from the dead after his crucifixion -- is the centerpiece of Christianity. In this five-week series we're going to examine resurrection carefully. We'll begin by looking its Old Testament roots, Jesus' teaching on the subject, and Jesus' own resurrection from the dead. Then we'll explore the meaning and significance for us of Jesus' resurrection, as well as the proofs we have that his resurrection actually took place. Finally, we'll consider what the Bible says about the resurrection of our own bodies. Let's begin by defining some terms. By "life after death" people are usually referring to the state of being alive, conscious, or something, after the physical phenomenon of death. But by "resurrection" we are referring not just to the soul or spirit, but specifically to the physical body in some way. The Greek word for resurrection (anastasis), comes from the verb anistēmi, "to raise, arise." The other verb used occasionally is egeirō, "to awaken, rise." Not that the Greeks believed in resurrection. They didn't. The New Testament uses these words to describe a raising up of the body after a period of being dead. The New Testament teaches a raising of our physical bodies at the Last Day to even more life than they had when we were "alive" before. "No one remembers you when he is dead. "Do you show your wonders to the dead? with my own eyes -- I, and not another. This passage is notoriously difficult to translate.6 But is Job beginning to see something beyond the grave? I think so. Q1. How does Job's vision of resurrection (Job 19:25-27) differ from the Jews' former understanding of death as Sheol? What is progressive revelation? The phrase "light of life" (NIV) doesn't occur in the Masoretic Hebrew text, but is found in both the Greek Septuagint translation as well as the Hebrew text of the Isaiah scroll found among the Dead Sea Scrolls.10 The Servant's contemporaries saw him as "cut off from the land of the living" (53:8). But 53:11 indicates that the Servant will see "light" -- that is, life outside the grave -- even after his atoning death. I expect that Jesus also saw this promise, which underlies his teaching to his disciples that "it is written" that the Son of Man would be raised from the dead (Luke 24:25-27; 8:31; 9:31; 10:32-34; 14:21). "I saw a great many bones on the floor of the valley, bones that were very dry. This may not be an actual prophecy of resurrection as much as a figure of the restoration of a nation. Nevertheless, it added to the Israelites' consciousness of resurrection. By the time the first century rolled around, resurrection -- which had just a few references in the Old Testament -- was now held by the largest number of people in Judaism. There were essentially three beliefs about the resurrection in Jesus' world. The Sadducees represented the aristocrats, a minority group that held a good deal of power in Judaism. They held a considerable number of seats on the Sanhedrin, the ruling council. The high priests' families were also Sadducees (Acts 5:17). They denied the resurrection of the dead on the last day, and held to a view that the dead were in Sheol, as some of the earlier portions of the Old Testament had taught. They didn't take this position because they were the "liberals"; rather they were the "conservatives" of the time. Since the resurrection wasn't clearly mentioned in the Pentateuch (the first five books of the Bible) and the historical books, they refused to accept it (Matthew 22:23; Acts 23:8). However, the Sadducees didn't exist as a major group in Judaism after the destruction of Jerusalem in 70 AD. The Pharisees strongly held the view that the there was a resurrection. They were a reform party in Judaism, who believed in a serious commitment to holiness and obedience to every command in the Bible. However, their reformation had become hardened into a brittle and self-serving personal righteousness that tended to keep the letter of the law, but often missed the spirit of the command. Some of Jesus' most scathing commentaries on contemporary Judaism were directed at the Pharisees -- though he agreed with them about the resurrection of the saints at the Last Day. The third major group was represented by the Greco-Roman beliefs held by the Roman governor and the army of occupation. They weren't Jews, of course, but represented the dominant worldview met by the apostles when they began to preach the resurrection of Christ outside of Israel in the Mediterranean world. Greeks believed in the immortality of the soul, but scorned the resurrection of the body as a silly belief (Acts 17:18, 32). 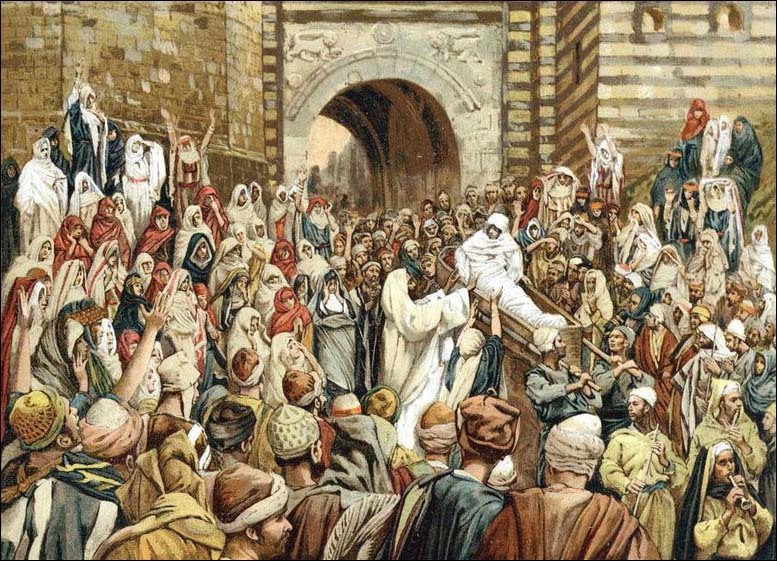 J.J. Tissot, detail of "Jesus Raising the son of the widow at Nain" (1890), original watercolor. Larger full image. There had been restorations to life before in the history of Israel. Elijah had restored the son of the widow of Zarepheth (1 Kings 17:17-21). Elisha had raised the son of the Shunnamite woman (2 Kings 4:32-35). Jesus had raised Jairus' daughter (Mark 5:40-42) and the son of the widow of Nain (Luke 7:11-15). Of course, Jesus' friend Lazarus was raised after having been dead four days (John 11). 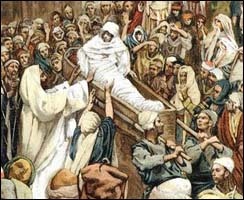 At the hour of Jesus' death, Matthew records that the bodies of "many holy people" were raised to life (Matthew 27:51-53). These resurrections are treated as harbingers of Jesus' coming resurrection, proof that Jesus had death in his own control.11 The difference between these resurrections and the resurrection of Jesus and the saints on the Last Day was that these people later died. Jesus' statement echoed Daniel's prophecy and paralleled the Pharisees' teaching of "a resurrection of both the righteous and the wicked." (Acts 24:15). Jesus taught that this would be a time of reward for those who had followed the Lord: "You will be repaid at the resurrection of the righteous" (Luke 14:14). Q2. (John 5:28-29; Acts 24:15) According to scripture, both the righteous and unrighteous will experience resurrection. What will be the result of resurrection for the righteous? Q3. (John 11:23-25) What do you think Jesus meant when he said, "I am the resurrection and the life"? What role will Jesus play in the resurrection of the dead? And so Pilate ordered a guard to be placed. We make a distinction between three days and the third day, but in Greek, these two phrases meant the same.12 After his resurrection, Jesus explained: "This is what is written: The Christ will suffer and rise from the dead on the third day...." -- probably a reference to both Hosea 6:1 and Isaiah 53:11. Q4. Why did Jesus' enemies heed his prediction of being raised on the third day even more than his disciples? Did his enemies expect him to rise? Did his followers? The resurrection of the dead was the strong expectation and hope of Jesus. Is yours? In the next lesson we will examine Jesus' own resurrection from the dead. Lord, implant in us the strong faith in the resurrection that Jesus himself held. In Jesus' name, we pray. Amen. R. Laird Harris, shā´al, TWOT #2303c. Hebrew qeber, "grave, sepulcher" (R. Laird Harris, qābar, TWOT #1984a.). Hebrew ´ăbaddôn, "destruction, ruin, Abaddon," from ´ābad, "perish, be destroyed, a common word for "to die" (R. Laird Harris, ´ābad, TWOT #2d). Wright (Resurrection, p. 118) asserts that "the original Hebrew text is almost certainly denying that YHWH will redeem Israel from Sheol and Death. However, the LXX and other ancient versions, and also the New Testament, take the passage in a positive sense...."
Wright (Resurrection, pp. 118-119) sees this verse as originally indicating a failure to repent, but that it is interpreted in a more positive by later Biblical writers. This verse can be construed in various ways. The Masoretic Text which underlies the KJV does not include the Hebrew noun &@096;or, "light" (NRSV) or "light of life" (NIV). However, they appear in the both the Septuagint and in all the Dead Sea Scroll (Qumran) copies of Isaiah, which "constitutes strong evidence" (John N. Oswalt, The Book of Isaiah: Chapters 40-66 (New International Commentary on the Old Testament; Eerdmans, 1998), p. 399, fn. 43. Light can symbolize general "life" (Herbert Wolf, TWOT #52). On Psalm 36:10, Mitchell Dahood (Psalms (Anchor Bible; Doubleday) 1:221-222) argues that "to see light" is often really to see the light of God's face in immortality, though this may refer to mortal life as perhaps Psalm 49:19 (so Peter C. Craigie, Psalms 1-50 (Word Biblical Commentary, vol. 19; Word, 1983), p. 292) See a similar idea in Psalm 17:15. Grant R. Osborne, "Resurrection," DJG 673-688. Ladd, Resurrection, p. 109, writes: "Students of the Greek language have proven that, contrary to English usage, the two phrases were identical in meaning." He cites for this Vincent Taylor, The Gospel according to St. Mark (London: Macmillan, 1952), p. 378.